Miami is the perfect travel destination for people who enjoy a mix of pool life, beach, party, mall shopping and food. Miami is basically a good place for pleasure seekers. 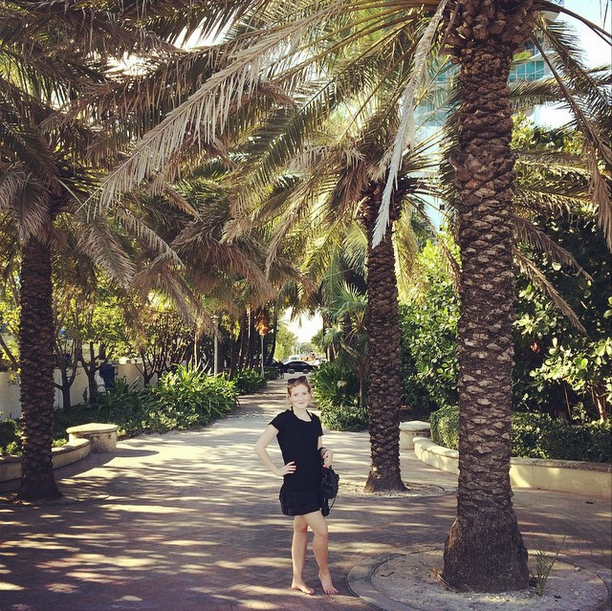 I was in Miami in December, my first trip there and I stayed there for four and a half great days. We were pretty efficient so even though we didn’t have much time there we still got to experience and see a lot of Miami. 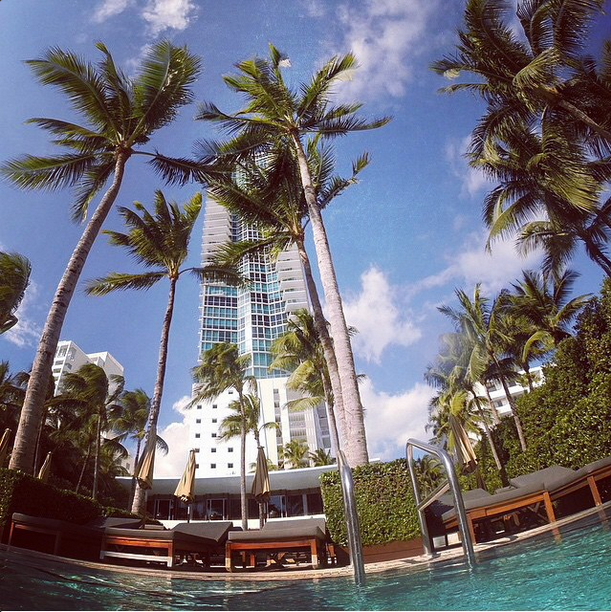 I will give you my suggestions for what to do, see and eat when in Miami. The first day we decided to rent the cool cruiser bikes to see as much as possible in Miami. I love biking and most places it is great way to get to see a lot if you bike around. 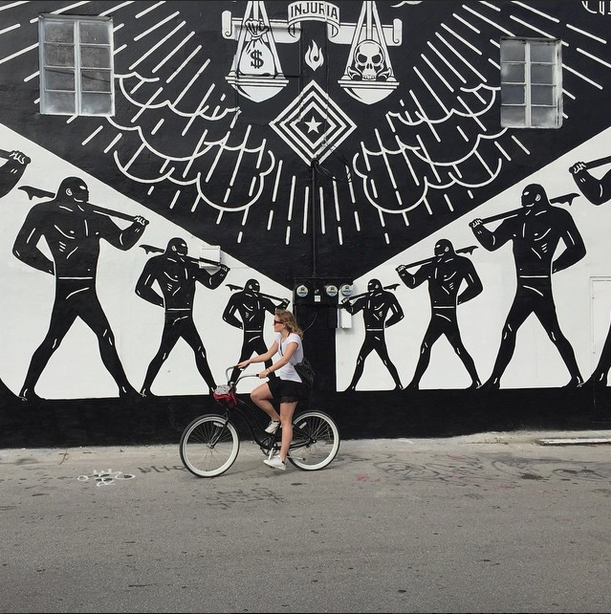 We took a long trip, biked the most of the day, crossed high ways and bridges and biked around the Wynwood area. Wynwood is an old warehouse industrial area that was abandoned, so different artists decided to occupy it around ten years ago. Today Wynwood contains The Wynwood Walls, a collection of amazing street art graffiti murals created by world famous street artist. 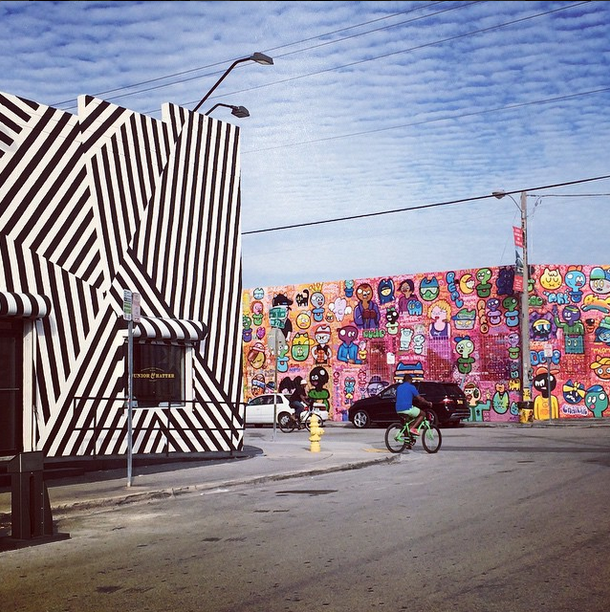 Wynwood also has fashion stores, over 70 different galleries, great restaurants and cafées and is definetely worth a visit. Along South Beach there is a board walk where you can see the how the citizens of Miami care about their looks and how they keep in shape because constantly you see good looking people in all ages running or biking up and down the board walk. The beach is great and a stroll down the board walk is too. A must if you are in South Beach, Miami! I don’t remember the last time I was so amused as when I saw the drag queen shows at The Palace. You sit down and get a drink and every 10 minutes the host introduces a drag queen and out comes the most amazing looking drag queens that gives the audience a crazy show. They dance around on the sidewalk while wearing amazing costumes and 15 centimeter high heels, yet still able to shake booty, jump around, doing cartwheels (still with high heels on) better than I could ever dream of being able to do. Ocean Drive (where The Palace Bar is also located) is in full party bloom every night. This is not a fancy place, and it is also on this street you will find restaurants that have bands that play back while they serve you drinks in the size that could get five people drunk at the same time. This is also the place where you can find a homeless man and invite him to join you for dinner (like we did, what a night) while you can look at people that are wearing rather tacky outfits with tops that are a little to short and skirts likewise, but you are guaranteed to have a fun night. Ocean Drive is also the place where you will see the classic art deco Miami buildings. When in America a visit to a mall is a must, and the same goes for Miami that has at least a ton of malls options to offer. We went to Lincoln Road Mall which is an outdoor mall that has a mix of cool, unique stores and all the regurlar stores like H&M, Zara and Forever 21. We also went to Aventura Mall which is a typical American mall with what seems like a million stores. We were there for hours and yet we didn’t see or go to all stores. The mall contains every kind of store from high end brands like Fendi, to the big chains and all the American stores plus a Macy’s. Amazing restaurant located in Wynwood. Between amazingly painted walls you sit outside in the sun while enjoying food from the latin influenced restaurant WKB. 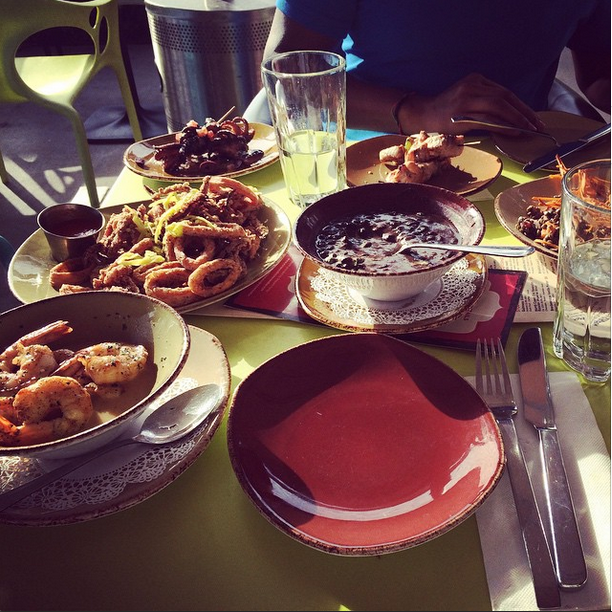 The food is like tapas and the menu card contains a lot of fish, meat and other classic tapas dishes . Also located in Wynwood this is the place where you can definetly tell the reason that Wynwood is being called the hipster neighborhood. Because of the fact that Miami is warm all year around people sit outside in the shade under the trees with their Macbooks while drinking great coffee, which is what the place is known for. Every day The Setai has a brunch buffet and this is one of those brunch buffets that covers all of your needs and you couldn’t ask for more or miss anything. 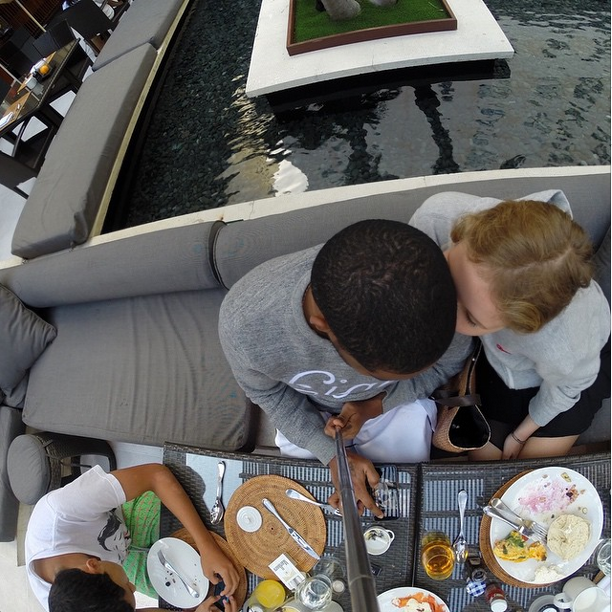 The brunch has healthy porridge, fresh fruit, cakes, bread, bagels, bacon, eggs, waffles, yogurt, granola, salad – literally everything you can think of for a brunch. 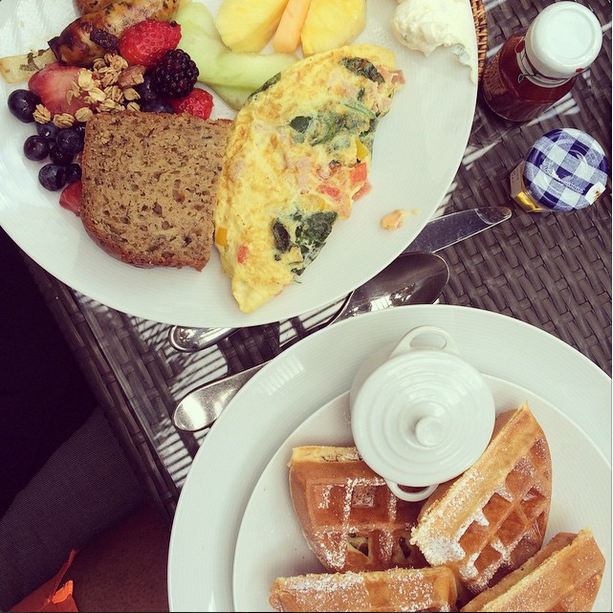 The brunch can be indulged in the amazing court yard at the hotel. My conclusion about Miami is definetely that it is a great place to have fun!